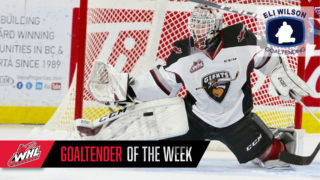 Friday night in Portland, OR the Vancouver Giants (9-2-1-0) dropped a 5-3 decision to the Portland Winterhawks (6-3-0-1). Jake Gricius scored twice on the power play for Portland while Cody Glass added a goal and an assist. Portland struck twice in a span of a minute and 10 seconds in the back-half of the third period to help complete the Winterhawks comeback from a 3-1 deficit. 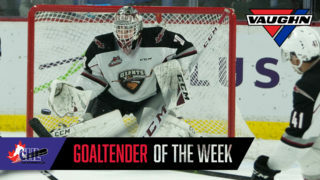 James Malm, Justin Sourdif and Bowen Byram had goals for the Giants who failed to secure a point for the first time in a span of nine games. Portland’s power play finished two-for-five on the night and helped kick-start their offense in the first period at 13:22. Jake Gricius parked himself in front of the net and redirected a pass from Joachim Blichfeld past Giants starter David Tendeck to give them the 1-0 lead. With less than a minute to go in the first, the Giants responded with a power play tally of their own. James Malm notched his team-leading ninth goal off a blistering shot from the slot that fooled Winterhawks starter Shane Farkas. Vancouver’s power play would end the night one-for-four. A pair of goals a minute and 41 seconds apart early in the second vaulted the Giants ahead 3-1. Justin Sourdif gave the Giants the lead when he knocked his own rebound past Farkas at 2:58. Then Bowen Byram snagged his fifth of the season when he whacked home a Yannik Valenti rebound at 4:39. A 70 second sequence of the third period would turn the tide for Portland. 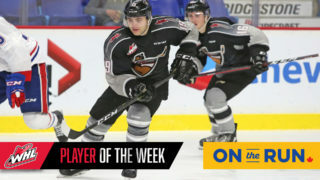 At 12:29 Portland tied the game when Cody Glass’ one-timer from the left-wing circle dribbled through David Tendeck and across the red goal line. Up next for the Giants: A rematch with the Portland Winterhawks at the Langley Events Centre on Saturday night at 7:00 PM. 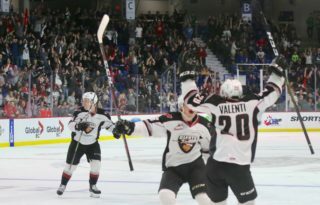 Saturday’s game kicks off a stretch of eight straight games at home for the Vancouver Giants. With an assist, Davis Koch extended his point-streak to five games. During that span, Koch has two goals and five assists for seven points. The Vancouver Giants have scored a power play goal in four straight games and in seven of their last eight. During that span, the Giants have gone 10/31 with the man advantage. Bowen Byram has recorded points in five of his last six games. During that span he’s registered four goals and four assists for eight points.